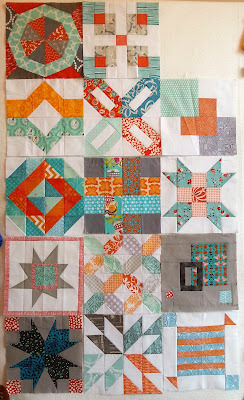 Just a quick look at my aqua and orange blocks from three rounds of the Sew Pieceful Block Swap. I'd say the blocks are playing together quite nicely, don't you think?. August was my fourth and final round with this color scheme so now I can move on with my top-making ideas. I'll end up with 20 blocks so that should give me a nice sized throw when I'm done.